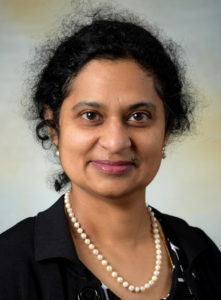 MIDDLETOWN, R.I. — Southcoast Health announced today that Jayanthi Parameswaran, MD, has joined the Southcoast Physicians Group and is located at 672 Aquidneck Avenue in Middletown, R.I.
Dr. Parameswaran is a board certified Internal Medicine physician. She received her medical degree from the Jawaharial Institute at Pondicherry University, India. She completed her residency at the State University of New York Downstate Medical Center, Brooklyn, N.Y., where she also served as Chief Resident. Dr. Parameswaran was recently voted as Best Doctor by Newport Life Magazine readers. Appointments can be made with Dr. Parameswaran by calling 401-847-0519 or by visiting www.southcoast.org/doctors.